For the 1988 thriller Deep Rising, an almost postmodern combination of suspense, bloodthirsty violence and comedy made composer Jerry Goldsmith's job more difficult than usual. Goldsmith responded to these challenges with a deceptively complex score sporting multiple rhythmic and thematic elements evident right from the start with a growling, heavy motif for tuba and low brass in the film’s opening cue. 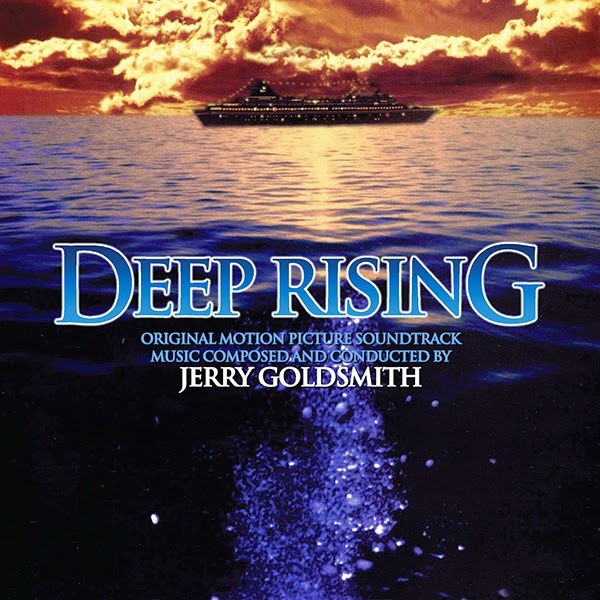 For the original 1998 Hollywood Records release of Deep Rising, Goldsmith selected just ten tracks from his lengthy score, totaling about 33 minutes. For this premiere release of the entire score, Intrada was given access to the excellent-condition original Sony 3348-format 48-channel digital session masters courtesy of Walt Disney Records. Listeners can now enjoy over an hour of music pulsating with the composer’s signature action writing. Complex rhythms, a dynamic low-brass theme representing the vicious undersea monsters, a rousing and energetic theme for the salvage vessel, underwater suspense music, exciting and aggressive sequences for brass and strings—all delivered in vivid and punchy digital stereo. The film tells the story of a salvage vessel run by John Finnegan (Treat Williams), heading for a rendezvous with a massive, high-tech ocean liner, the Argonautica, on its maiden voyage. Finnegan has been hired by the ruthless Hanover (Wes Studi) to take his team of cutthroats and a load of powerful torpedoes to meet the ocean liner. Unbeknownst to Finnegan, Hanover has arranged to scuttle the overpriced vessel for the insurance money—after robbing its boatload of rich passengers. But when Finnegan’s ship ties up alongside the Argonautica he finds that the ship is empty; he eventually discovers that the passengers have been devoured by a gigantic, kraken-like sea creature that is now picking the salvage team off one by one. With his cowardly, smart-mouthed mechanic Joey (Kevin J. O’Connor) and a wily female jewel thief named Trillian St. James (Famke Janssen), Finnegan struggles to escape both the sea monster and Hanover’s thugs before the Argonautica sinks. Just Announced, this is going to be a great and more complete! Goldsmith did Deep Rising - whoa.